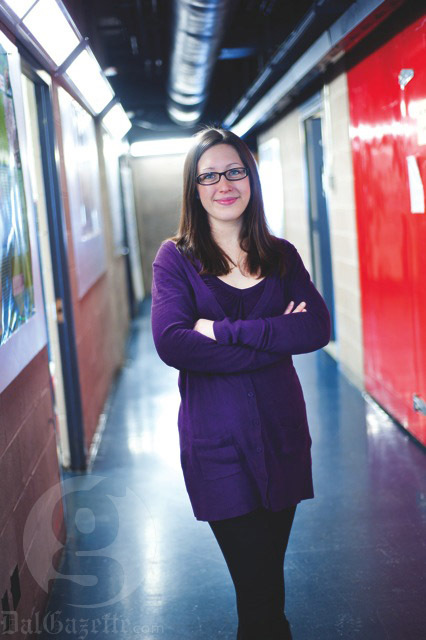 Christina Lord is nothing short of a teaching assistant all-star. After completing an undergraduate degree here, the Dalhousie PhD candidate knows how to get people excited about science. She spends her days in a lab scattered with papers, coffee mugs, bubbling aquariums and a microscope that is monitored 24 hours per day. In this cluttered combination of chaos and organization, Lord knows exactly where to find the file from a meeting last year where she discussed the number of hours each term biology students get one-on-one help from their teaching assistant (TA). As one of 741 people currently working as a TA at Dal, Lord is part of the group that is filling the gap between the number of faculty and the increasing student population. From the 2005/06 academic year to 2010/11 Dal’s student population grew 7.36 per cent, while the number of full-time and permanent part-time faculty grew only 1.77 per cent. That growth means there is less faculty time available to each student each year. But Lord and other TAs like her are proof that there is opportunity to be found in this statistic. Katie Sykes is a TA in the College of Sustainability. “There’s come to be more training for TAs and more professionalism,” she says. Now she says her tutorials are planned with care. She attends the class lectures, does the readings, goes to weekly staff meetings and plans group discussion questions. Sykes, and many other TAs, see the job as an opportunity to develop their academic careers. Much of their training comes from Suzanne Le-May Sheffield, the associate director (programs) at the Centre for Learning and Teaching. Sheffield offers a certificate program for graduate students and postdoctoral fellows interested in jump-starting their teaching careers. The program, Certificate in University Teaching and Learning (CUTL), and other workshops offered at the centre, help TAs and faculty members develop and practice skills that Sheffield believes can often be overlooked. “Universities are still more heavily research-focused than teaching-focused,” she says. The number of Dalhousie students rose an overall 7.36 per cent between 2005 and 2010. The number of full-time and permanent part-time faculty rose an overall 1.77 per cent between 2005 and 2010. Though TA numbers fluctuate over that time period their role has changed to fill the gap between faculty and the growing student population. Lord agrees. “As graduate students we’re always so research-focused, it’s publish or perish,” she says. “Everyone is so obsessed with writing journal articles and being in a lab.” She believes that practising teaching is just as important as practising research and lab techniques. CUTL expects participants to design their own academic course, practise delivering lectures and develop their own teaching philosophy. And the importance of these new learning possibilities grows as the faculty-to-student ratio decreases. TAs are playing an increasingly significant role. “They’re filling in the support for students to get opportunities that they otherwise wouldn’t get,” says Sheffield. Lord, who makes herself available to help students at any time, in any class and even with “general guidance for what comes after an undergraduate degree,” is a perfect example. Her lab door is always open to students who need extra help, which can make a big difference, especially for those in large introductory courses. This is the reason Lord makes sure her students feel comfortable approaching her. “I was literally sitting in the exact same seat you are five years ago,” she tells her classes at the beginning of each term. There’s a reason Lord won the Biology TA Award in 2010. Not all TAs are like her. In fact, there can be challenges with having TAs as the primary point of contact for students in large courses. Todd Bishop, lab instructor and course coordinator for introductory biology, says sometimes they end up hiring graduate students from related departments or undergraduate students to fill the TA positions. “We cannot staff all of our positions from our graduate student pool within the biology department,” he says. Lord says this offers a wide range of expertise that can benefit a course, but “sometimes lack of knowledge is a big problem.” She’s seen students struggle to grasp concepts that TAs may not fully understand themselves. This is where faculty members come in. “They’re experts,” says Lord, a trait not even the best-intentioned TAs can always match. Another issue that can arise is grade discrepancies when many different TAs are marking the same assignment. Brittany Gingrich is a fourth-year psychology student who has been frustrated by this in the past. Two years ago she did terribly on a lab assignment and compared it to a friend who had scored 30 per cent higher. They found their assignments had almost identical results. How to grade assignments is just one of the many topics covered in the workshops the Centre for Learning and Teaching offers TAs and faculty members throughout the term. Training like this is one way universities are responding to quality demands from their high-paying students, says Sykes. She and Sheffield agree that this is a shift away from the primary focus on research that has characterized universities for decades. “It would be great if the university had more funding so that there could be more faculty members, but I still think there always needs to be teaching assistants,” says Sheffield. In the same way TAs can’t replace the expertise of a faculty member, faculty can’t replace the valuable support TAs offer students. Correction: In the original version of this article, the CUTL program was confused with another program at Dalhousie, and Christina Lord was said to have completed her PhD at Dalhousie, when in fact Lord is a PhD candidate. The Gazette regrets the error and the new version of this article reflects those changes. Great Article!! Good Job Christina! !